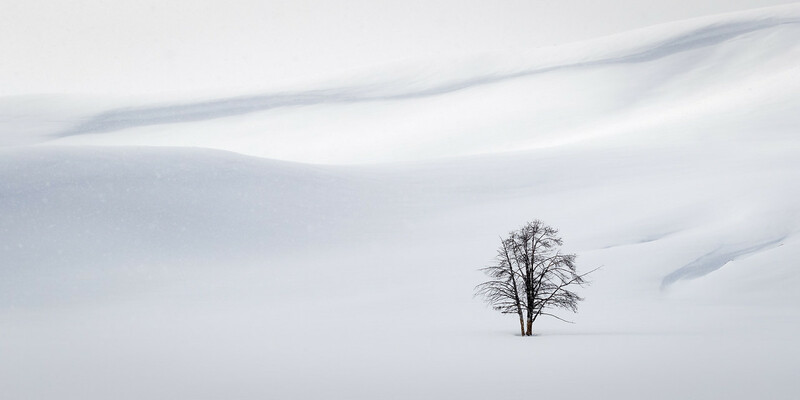 I like the simplicity of the lines in the snow with the complexity of the tree. Both have merit, but I rather prefer the second version simply because there are two protruding limbs in the second which better fill the space. The first image does have that wonderful bank behind the tree with a curve which acts as a natural boundary line. Thinking back, which scene struck you first and why? Kevin, I go back and forth about which I prefer. When at the scene it was going to be a long lens shot, as there was at least 200 yards of 5 or 6 foot deep snow in the valley in front of the tree. I began shooting several different variations all with a 100-400mm lens. We weren't going to change the bearing to the tree very much since we were so far away and on foot in snow country. I didn't even think to shoot a pano, as we were only there for a few minutes, and I do regret that, as I shoot a fair number of hand held mid-tele panos when wandering about. Oh, it was snowing too, so there is a bit of softening from the snow in the air. 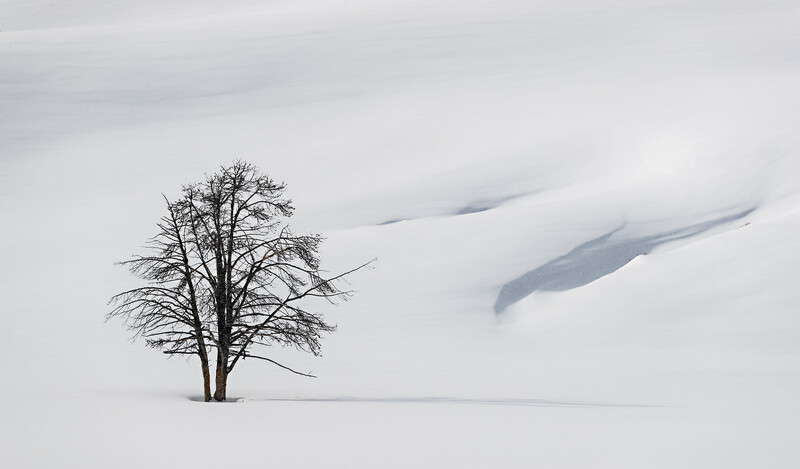 I finally decided that it was either to shoot the tree as the subject, kind of like in the second image, or the snowbank as the subject with the tree as grace note, as in the first image. If I had to choose, I would choose number 1, i think. I don't really see much different in the aspect of the tree itself, to my eye. I view both images with the tree as subject. From that mental perspective the first scene is both isolated and lonely, while the second is more simply isolated. The additional detail visible in the second image tree is an additional attraction, pulling me into the scene. Two completely different 'vibes' of the same view, but both have power and interest. I think that printing both images very large may show the respective strengths more clearly, but no clear winner with both being very well seen and captured. I like them both but prefer #1 because of the wonderful exposure of that curving snow bank. And in this case, I prefer the "isolated and lonely" view to the "simply isolated". They are both wonderful exposures! 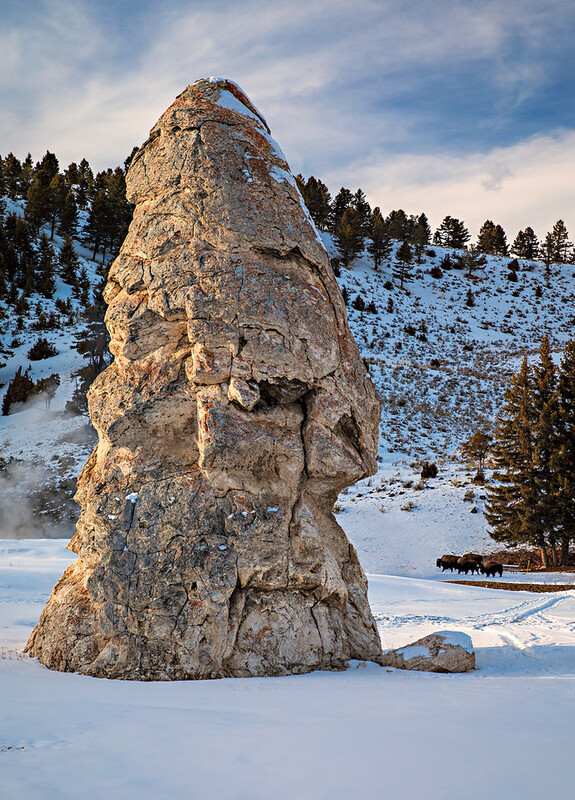 One of the things I enjoy here is that I'm always learning new things... "pareidolia" - what a great word! I also prefer # 1, I like the isolation of the tree. Both pictures are very appealing to me. I'm with Sara and Denise as to favouring #1 because of similar reasons - it just shows the vaste amount of nothing else than snow around that tree, and this is triggering more of an emotion to me. The thought about isolation probably triggers emotion in many. Also, I love the patterns and shadows of #1 in the snow a lot! Number 2 is visually appealing, but does not really work for my mind. The first one has more context and emphasizes the isolation of the tree. I think that's why I prefer it. Luckily, you don't have to choose--you have two fine shots. You could shoot it almost anyway you wanted in the light that afternoon and come home with a very nice image. It was lovely to see.